April 30, 2012 by Venky. The Bulldog Goes Sub-30 on Nandi – Finally!! There was no fear. Only a calm acceptance, and may be, a welcoming of the suffering. The mind was clear. There was a rhythm in that heavy breath and in those suffering legs. There was a calm that went beyond the labored breath and the suffering legs. It was meditation. A meditation in pain. The Bulldog hasn’t seen Nandi this year. It last climbed Nandi before TFN in December 2011 and its goal of a Sub-30 Nandi remained unfulfilled with a 31:20 on its last climb. I wanted to climb immediately after TFN but a couple of planned rides got cancelled and it still remained a dream. With the Bulldog’s second birthday coming up in a couple of days, I wanted to give it another shot. Unlike the last time it climbed, when it had 700x28c tires, it now sports 700x23c that it got during TFN. Just for this ride, I borrowed the road pedals from the Lemond so that I could use the stiffer road shoes. I removed the saddle bag and decided to leave the pump too, thinking that someone in the team will have a pump. The night before, wanting to have as little rolling resistance as possible, I used my new floor pump to pump it up to 110psi instead of the usual 90-100psi. I was calmly confident that both of us were ready for a Sub-30 climb. Sunday morning, I donned the team kit, stuffed the pockets with essentials, filled the bottles and took the Bulldog out. It was time to start. The front tire was flat. ‘Damn! I will be late. The team will be waiting’. With no time to lose, I quickly messaged Arvind that I could be late by 10mins and quickly set about changing the tube. I noticed that it was a spoke pinch. Looks like I got a little greedy with the air pressure. I quickly changed the tube and pumped to 90psi. Wanting the team to wait as little as possible, I started hammering and was in a time trial mode in no time. The team was all set to roll as I reached Siva’s road 5mins late. There was a new face in the group. It was Mahito Isejima, who moved to Bangalore recently on work. Spectrum Racing: The team train had a visitor on the day.. The guys quickly formed a paceline and start drilling it. We took one minute turns at the front. The moderate target pace of 30-32kmph that I suggested seemed to be too modest for a few guys. They began to hammer well above it. Although it looked like it would be a good warmup for the climb, I was also afraid that it could end up being a little too much of a warmup. I wanted to conserve for the climb. As these thoughts were running around my head while trying to stay in the paceline, I noticed a flat again on the front tire. I quickly flagged the train down and began to change the tube wondering if it was a spoke pinch again. It was a pinch but not a spoke pinch. Looked like, in the hurry, I didn’t let the tube sit properly inside the tire when I changed the tube in the morning. I quickly changed the tube and the train began to move again. We stopped a for a brief moment at Nandi turn-off from where Mahito and Shankar decided to turn back. 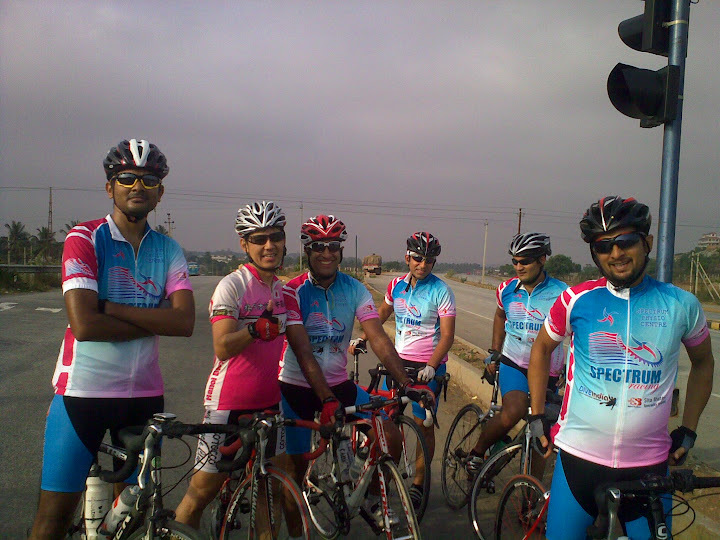 The rest of us, Arvind, Ameet, Amrish, Gaurav and I, started riding towards Nandi. Mahito Isejima joined us till Nandi turn-off before joining Shankar on the way back. Rest of us, Arvind, Ameet, Gaurav, Amrish and I went to Nandi. As we began riding towards Nandi, I started feeling a bit uneasy. I was wondering if the warmup was a bit too much. I began to have doubts about the Sub-30 climb as I felt the energy levels dipping. I quickly ate some of my on bike food and drank water hoping that it would help. At this point, I was hoping that I would find my legs once on the climb. It happened before. So, there was hope. As was the custom, I made the team stop for my bio-break for the nth time a couple of kms before the climb began. Just before the climb Arvind asked me to go ahead and set the pace. But I told him, I am not feeling that great and I could only ruin his PB plans if I set the pace. So, he took the lead. As we went past the Nandi statue at the base, Arvind started sprinting up the climb and I followed him. As we went past the first nasty incline and went past the check post, the heart rate got up nicely and the legs began to find rhythm. So, I decided that I would try and set the pace. But now, Arvind began to feel slightly down and told me to go ahead. May be he put in too much in that starting sprint. I went ahead. It must be really missing Nandi. There was a spring in the Bulldog’s step. It was raring to go. My legs were back. They were pumping well. The heart rate was quickly near LT. But, there was no hurry. I just went with the flow and settled into the rhythm. I forgot all about Sub-30. By then, I knew it was going to happen. Runners For Life was having their club run and there were many runners on the climb. Some running up and some coming down. There were a few cyclist friends among them who recognized me and cheered me on calling out, ‘Go Venky go’. I smiled back, nodded and shouted back in acknowledgement as I kept going. I covered the first 5km in a very good time and approached my nemesis, curve 33, in relatively good shape. There was no fear. Only a calm acceptance, and may be, a welcoming of the suffering. The mind was clear. There was a rhythm in that heavy breath and in those suffering legs. There was a calm that went beyond the labored breath and the suffering legs. It was meditation. A meditation in pain. I took the turn on curve 40, sighted the arch, slowly reached it among cheers of the running friends there. I hit the lap button and saw 26:25. It was well beyond what I was hoping for. Never imagined, after the first climb up Nandi last April, that a Sub-30 was possible. It was a PB both for me and the Bulldog, beating the previous best on the Bulldog by almost 5mins(31:20) and the PB on Lemond by more than half a min(27:02). I got down the bike , quickly found a place to flop down to rest and regain my breath. When you reached the top, when you stop and get off the bike, you quickly realize the amount of suffering you just went through. But, that addictive drug, the joy of the accomplishment, quickly washes out any memories of that suffering and makes you go back to suffer again. First climb for the Bulldog this year and it gave me a 26:25. My PB on any bike. Arvind did have his PB after all with a 28:10 climb time bettering his previous record by a few seconds. Ameet, Amrish and Gaurav finished their climb and we all sat there for a while and posed for a few snaps. After a bit of chit chat with Neera and Dipankar who were there after their run up Nandi, and after a few photos, the team began descending. Near the base, we were made to repeat a few climbing poses by our team photographer, current Half Ironman finisher and future Full Ironman finisher, Manjula. After the photo shoot, I had another flat. Now on the rear tire. A stapler pin finding its way in. I fixed it with the help of Ameet and the running friends there before joining the rest of the team for breakfast. After a good breakfast, we rode back via Siva’s road. The Sun was in full force and the guys were in a hurry to get back home. I just hung in there at the back of the pace-line and avoided suffering in the wind. Thanks for all the work guys. It was one memorable ride! 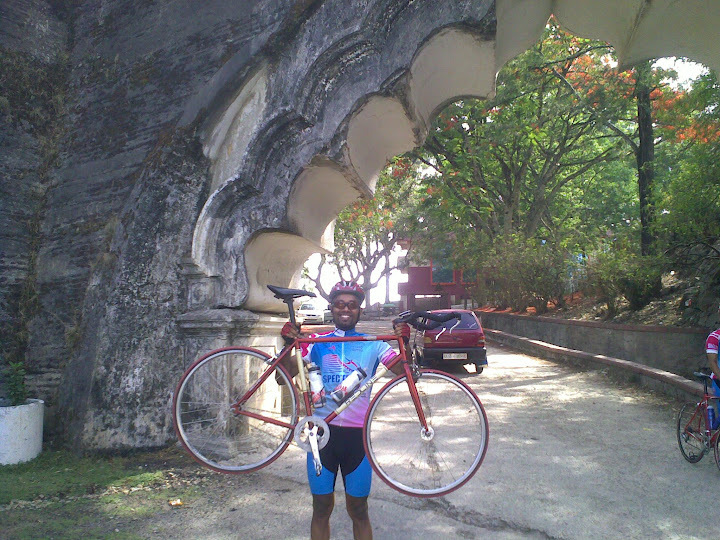 Congrats Venky, as usual a very well written ride report. Advance birthday wishes to Bulldog! and you did convey the same message in your usual way !! Thank you Shailendra, Ram and Sartaj!